There wasn’t much to be happy about in Jacksonville in 2016, but one bright spot was the emergence of Jalen Ramsey as a shutdown corner. Heading into the beginning of the regular season, there was plenty of hope for Jacksonville Jaguars fans in 2016. Sure, head coach Gus Bradley was coming back, but he finally had a seemingly talented roster to work with. Blake Bortles looked like a franchise quarterback and set team records in 2015 and he appeared to have a litany of weapons at his disposal. On the defensive side of the ball, the Jaguars added a handful of players who should have been upgrades (Malik Jackson, Dante Fowler Jr., Tashaun Gipson). Of course, almost none of those beacons of hope lived up to the hype and the Jaguars finished 3-13 with yet another top 5 draft selection. 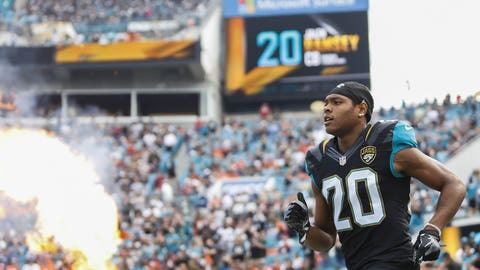 There was one guy who broke the mold however and became one of the top players at his position – rookie cornerback Jalen Ramsey. It was a lost and depressing season for the once-promising Jaguars. However, one of the brightest spots on the team ended up being the stellar play they got out of their rookie cornerback, Jalen Ramsey. Taken fifth overall in the 2016 NFL Draft, Ramsey quickly established himself as one of the best young defenders in football. A 16-game starter, it’s not hard to make the argument that Ramsey was the best defensive player in Jacksonville this year. Naturally, there were some rocky moments in the corner’s first season, as he allowed 703 yards and 14.6 yards per reception in coverage on the season, the most of any corner in the Top-10. Nevertheless, he grew into a player that quarterbacks paid for picking on. Ramsey was targeted 90 times on the year, trailing only Casey Hayward on this list, but only gave up a 53.3 completion percentage. What was most impressive about Ramsey’s rookie season was that he was deployed as a shadow corner against several top receivers. He passed those tests with flying colors. In Week 7, Ramsey covered Amari Cooper on 26 pass plays and allowed just one catch for four yards. Later in the season when the Texans faced them in Week 15, Ramsey covered DeAndre Hopkins on 26 pass plays and allowed just five catches for 46 yards, despite being targeted 11 times. It was quite the standout season for a player who needed to reiterate to many that he would indeed play cornerback in the NFL. He’s already right there by this metric, but it won’t be long until the football world at large recognizes Jalen Ramsey as one of the NFL’s best corners. As Harmon notes, Ramsey was particularly impressive because he was tasked with taking on top receivers week after week and holding his own. Ramsey still has to work on his technique a bit, but his athleticism and instincts are elite. Perhaps the most encouraging aspect of his play was how well he held up despite being targeted so often (90 times). Most shutdown corners don’t get a chance to break up that many passes, but opposing quarterbacks tried to take advantage of the rookie to little effect. There are a lot of questions about the roster this offseason, but one thing the Jaguars don’t have to worry about is who will be the number one corner.